[N.p., 1927. Pp. 12. 1 vols. 8vo. Original printed wrappers with title in Roman letters and hanzi, stapled, much of text in characters. Browned, some chipping and short tears, ownership stamp on covers, label on spine, else a very good copy of an extremely scarce publication. Pp. 12. 1 vols. 8vo. Gwoyeu Romatzyh Pinin Farshyh. The introduction mentions T. E. Wade and his system of representing Chinese characters, as well as the Postal (Telegraph) coding system, which employed supplemental characters to represent the different tones. 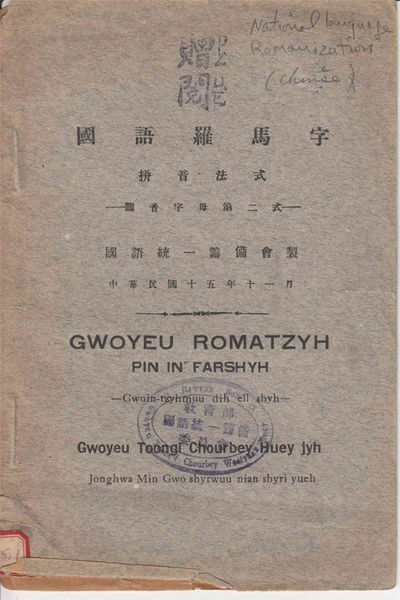 The pamphlet is an explanation, at once concise and comprehensive, of the use of the Gwoyeu Romatzyh Romanization.